Yes, I know it's a little late for a post about Easter, but this Easter was especially memorable for our family. Audrey got baptized! She's been asking us to let her get baptized for almost a year now, but she wasn't able to tell us why until early this year. We wanted to make sure she really understood what she was doing before saying yes. When we finally said yes and put in a request at church, our pastor decided he wanted to talk with her as well, so we set up a meeting. It was SO adorable and sometimes just funny to hear her describe her faith and what she understood baptism to be about. In the end though, we all agreed she really did get it! My mom was able to join us for Easter Sunday, which is when our church does baptisms this time of year. 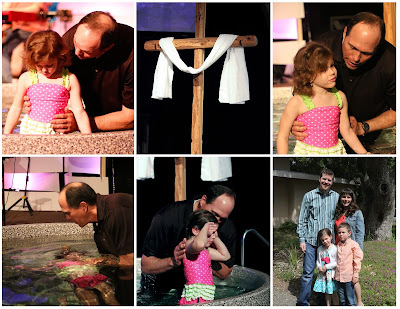 There were quite a few people getting baptized, and Audrey made sure she was first in line! There was no fear or hesitation. She was ready! She was so excited to have finally done this, and it being Easter made it extra special. The day before Easter the kids dyed eggs with my mom. 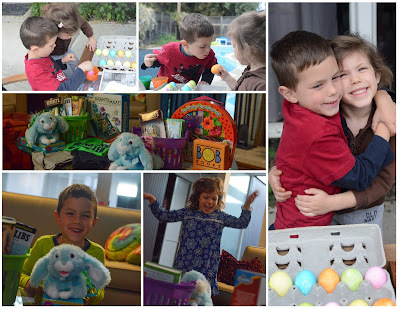 Then they woke up to some fun goodies in their Easter baskets and an egg hunt all around the house. It was beautiful a beautiful day in so many ways! We are so thankful for all of the people who pour into our lives and show all of us God's grace and mercy. We are especially thankful both Jackson and Audrey are filled with God's Spirit and believe in Jesus! There are a few more pictures from the weekend in this album.